Buy BAC to Nature Slurry Treatment From Osmonds. BAC to Nature Slurry Treatment consists of natural organic material which contains a blend of beneficial bacterial cultures, bacterial enhancers and enzymatic matter. BAC to Nature Slurry Treatment consists of natural organic material which contains a blend of beneficial bacterial cultures, bacterial enhancers and enzymatic matter. These micro-organisms are natures own "recyclers" and as such promote and enhance the breakdown of organic matter - specifically animal waste. BAC to Nature Slurry Treatment helps to regenerate natural microbial activity in animal waste and its micro-organisms create enzymes which are complex proteins that help them to digest or convert organic matter into other natural elements. A by-product of this process is the rapid and dramatic reduction or removal of the offensive odours normally associated with agricultural animal waste. BAC to Nature Slurry Treatment can be added to slurry to reduce the odours generated from the slurry in pits, tanks or lagoons or when it is being recylcled on the land. Slurry Treatment should be added to and mixed thoroughly with the slurry at a suitable point in the waste management cycle prior to the point at which odour control is required. Slurry Treatment can also be used to better control the odours in the animal housing with regular applications via fogging or misting into the atmosphere. The treatment of slurry in storage requires only one single application, although repeated treatments with proportionally smaller volumes of product can be effective. Additional treatments may be necessary if certain chemicals are introduced and should odours return the frequency of treatments should be increased. 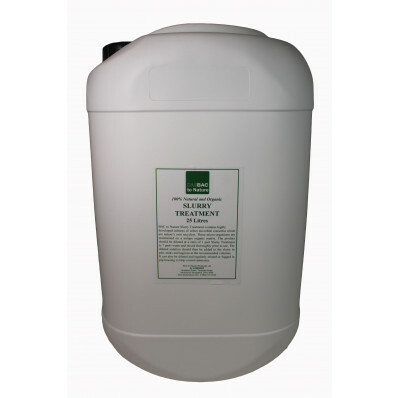 Available in 25 litre drums of concentrate for dilution prior to use with 7 parts water to make 200 litres of usable product. 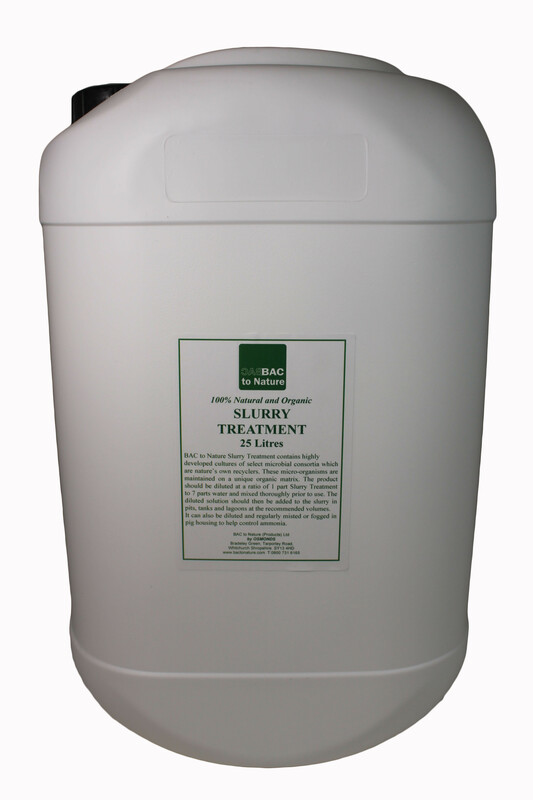 Initially - 25 litres of concentrate should be added to 25,000 gallons of Slurry. For maintenance this rate can be halved.